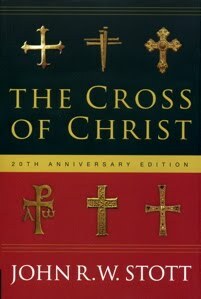 I’m a huge fan of John Stott’s The Cross of Christ, but I think a weakness of the book is its relative neglect of Christ’s resurrection. Not only does Stott have very little treatment of the resurrection throughout the book, but when he does discuss it, he explicitly downplays its importance. Especially telling is the section on pages 232-234, where he interacts with Michael Green’s The Empty Cross of Jesus on the question of the relative roles of Christ’s resurrection and his death within his saving work. Stott argues here that the soteriological role of the resurrection is limited to confirming the power of the cross and vindicating Christ from death and shame. The resurrection was essential, but not as part of the saving work, only as proof of it. In his terms: Christ’s saving work “was finished on the cross,” and “victory over the devil, sin, death was won there.” The resurrection was simply God’s “public endorsement” of this victory (233). I can understand why Stott wants to protect the exclusive centrality of the cross, because it is at the cross and nowhere else where Christ bears the Father’s wrath for our sins. I don’t want to take away one iota from the importance of Christ’s sin-bearing, wrath-absorbing crucifixion. Nevertheless, it seems to me that the New Testament conceives of Christ’s resurrection as more than mere confirmation of the cross, but as an integral part of Christ’s saving work together with the cross. Romans 4:25, for example: “Christ was delivered up for our trespasses and raised for our justification.” Cf. Romans 6:4, 8:34, I Peter 1:3, 3:21. While the cross and the empty tomb can be distinguished, I do not think they can be finally separated: they together comprise Christ’s saving work for believers. Jesus saves us by rising as well as by dying. “We divide the substance of our salvation between Christ’s death and resurrection as follows: through his death, sin was wiped out and death extinguished; through his resurrection, righteousness was restored and life raised up, so that – thanks to his resurrection – his death manifested its power and efficacy in us” (2.16.3). Excellent bro. I agree. Also, Gaffin notes 2.16.13, where Calvin says that whenever Christ’s death is mentioned, his res is included, and vice versa. (Resurr and Redemp, 115) Distinct but inseparable–like justification and sanctif, or the persons of the Trinity.